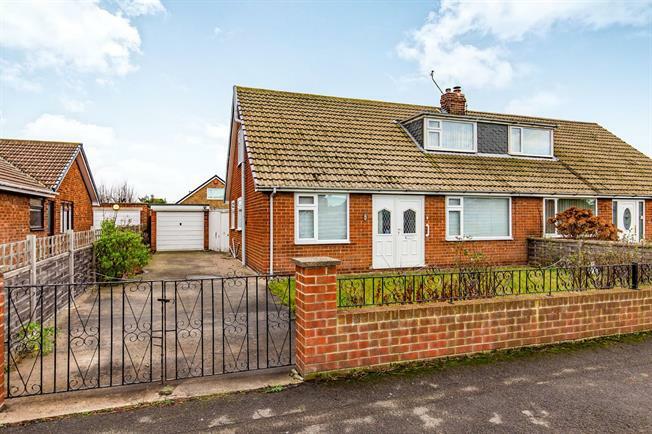 3 Bedroom Semi Detached Bungalow For Sale in Redcar for Offers Over £120,000. PART OF BRIDFORDS' NATIONAL OPEN HOUSE CAMPAIGN, CALL TO BOOK YOUR VIEWING Located within the small cul-de-sac of Penrith Close, this well appointed three bedroom dorma bungalow comes to the market chain free, with generous plot, single garage and large driveway. With a wide range of facilities close by, the property is located just an easy walk from the beachfront, briefly comprising of: entrance hall, living dining room, breakfast kitchen, bathroom, bedroom, landing and further two bedrooms. Good sized breakfast kitchen with a good range of wall and base units, with window and door leading to the rear garden. Fitted with three piece bathroom suite. Situated upon a generous plot, the property comprises of a gated driveway, with lawn to the front. With access to the single garage with spacious lawn to the rear.